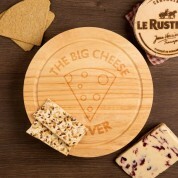 'The Big Cheese' cheeseboard is an ideal gift for someone who thinks they are in charge. This fun gift is laser engraved with the recipient's name, alongside the text 'The Big Cheese', and a graphic of a wedge of cheese. The quirky design will look great on display in their kitchen, and of course when it's in use and covered in cheese! 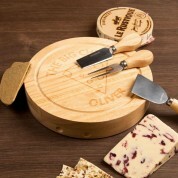 Made from hevea wood, the board also has an integrated speciality knife compartment. 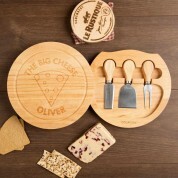 Three knives are included in the set – a cheese fork, Stilton knife, and cheddar knife. Everything you need for a good night in! The light wood is a natural product, and the colour of grain may vary from the one shown.